The isolation from Mumbai has been an eye-opener. I didn’t know I took so many things for granted back home, from the city’s crazy but robust public transport to the easy access to great food to the sheer convenience of grocery shopping. The first couple of months here in Yangon were a struggle to put food on the plate. Though S and I had stuffed our suitcases with essential ingredients, we still had dozens of things we couldn’t carry. Where can I buy dal? What about pav? Do we get curry leaves here? What about cumin seeds? The unfamiliar wet market, the cluttered supermarkets with so much foodstuff yet so little for me (dried shrimp and pickled fish aren’t my thing), and, of course, the language barrier, were a bit too much to handle. But once I got confident with my language skills, I began exploring the market and local stores, and things began to look up. I found curry leaves at the neighbourhood market. S found a pav seller. The local supermarket began stocking most types of dal! I even found fresh tamarind and jaggery (Myanmar jaggery is yum!). Now that I know where to find the most essential ingredients, I can breathe easy. You’d think I’m all set now. So I signed up for a cooking class run by a lovely Australian woman here to learn shortcrust pastry and later baked a delicious rustic pie! I observed Myanmar-style salads and prepared some at home—trust me, they give a new meaning to the word “salad”. In summer, I tried making mango shrikhand without sugar, and succeeded. When Mom visited, I insisted she teach me malai kofta. Last month, I was ready to try some new things in the kitchen. But a severe muscular spasm in my neck knocked me out and I couldn’t cook for several weeks. I visited Mumbai to see a doctor and get the treatment started. And, foodie that I am, I seized the opportunity to get my hands on some new things—such as a half-kilo box of quinoa. I’d once used a packet of Lemon & Herb quinoa (or something similar) someone had gifted me. I needed to prepare it like any instant food (like packaged noodles). But the quinoa didn’t cook at all. Maybe I did something wrong? Either ways, I felt like such an idiot that I banished the incident to the “cooking failures” folder in my brain, never to be accessed. But now, I’m a bit more confident of my culinary skills. And after the long break from cooking, I was hoping to try something new. Quinoa was fresh on my mind, and so began the hunt for a great recipe. Despite my neck pain acting as an irritating companion, I wanted to make a complete meal, not just a snack or “light meal”. 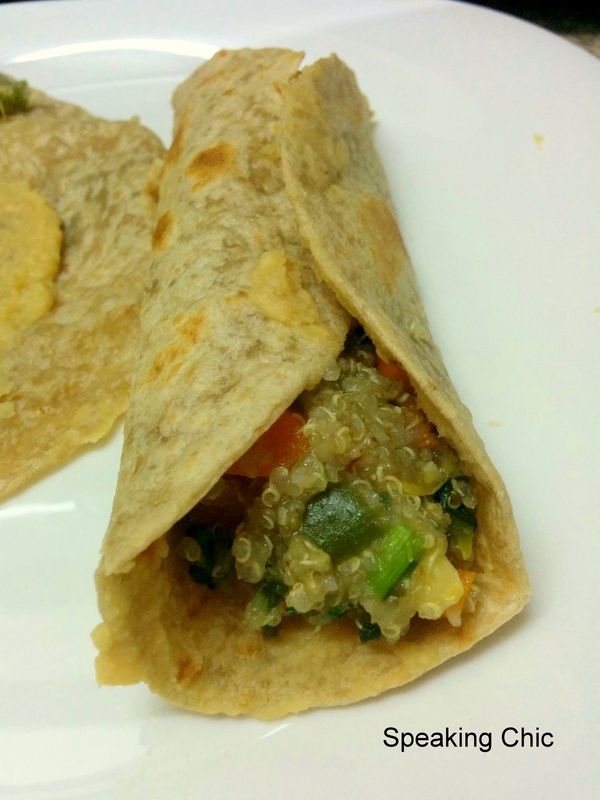 So I decided to debut my quinoa experiments with wraps. It didn’t all go smoothly. I underestimated the cooking time at first, then I ended up with more quinoa than expected. No harm done though. Halfway through cooking I realized that the dish was becoming a mix mishmash of several cooking styles and flavours. I mean, hummus with herb-seasoned veggies? Wrapped in a South American flatbread? What was I doing? But when I had the first bite with some vegan mayonnaise (yes, that’s a real thing), the elements fit together beautifully. S did a taste test and gave it a thumbsup. Phew. All’s well that ends well. Anyhoo, a bit about the recipe: The original recipe suggests cooking quinoa with the vegetables, but I decided to cook them separately because I wasn’t sure about cooking time and didn’t want to end up with mushy veggies and raw quinoa. It was wholesome, nutritious, delicious and hearty lunch! I used whole wheat tortillas from a local bakery. Wash quinoa well, then soak for five minutes in a pot. Drain the water, add two cups water to the quinoa (the ratio of quinoa to water is always 1:2). Put the pot on the stove and bring to a boil, then lower heat and let it cook covered. While the quinoa is cooking, heat oil in a pan, then add garlic and onion, sauté for a minute. Then add the green chillies and cook for few seconds. Add the vegetables to the pan with your seasoning or spice mix and a little water. Mix well, and cook for some time, stirring often and adding water if needed. The vegetables should soften a bit, but not lose their crunch. This could take anywhere from five to ten minutes. When done, switch off the flame. Squeeze in the lemon juice and mix coriander leaves with the vegetables. Meanwhile, drain the cooked quinoa. You know the quinoa is cooked when it’s soft and it seems to have “sprouted”. Keep it covered for five minutes, then uncover and let it cool. Mix the cooked vegetables with the quinoa. 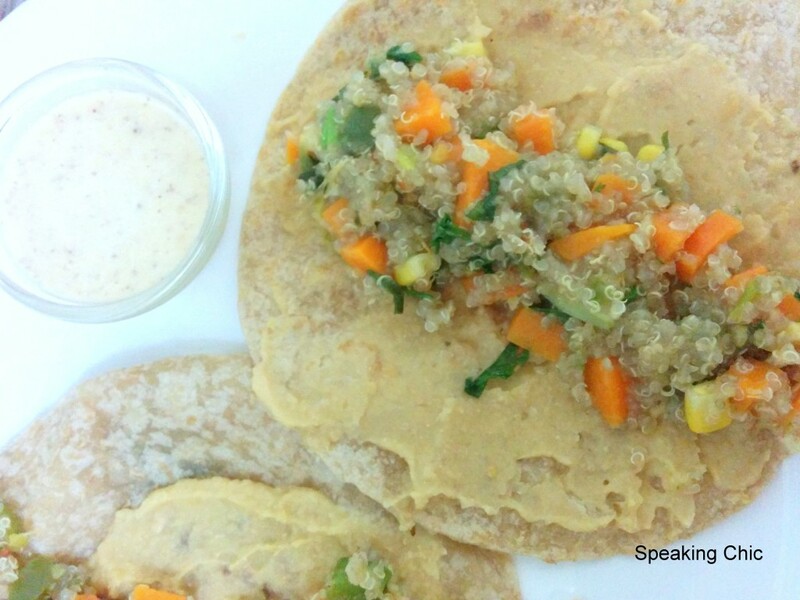 Dab some of your spread on a cooked tortilla, then add the quinoa-veggie mixture in a straight line across the middle. Roll it up and voila! Your quinoa wrap is ready. Serve with a light dip of your choice.